So beings Onslaught has Magneto's abilities and such does that mean Magneto doesnt have a home field advantage? Yes and no. Onslaught's biggest strength his the ability to take control over other mutants. You could argue that wouldnt work on Magneto. Unless someone can convince me how Onslaught could beat Magneto I'm going with the home team. If onslaught can't control Magneto, which I agree he couldn't, then it goes to Magneto. Onslaught has all of Magnetos powers + Xavier's powers. How would Magneto beat that in your mind? This is how I see it. Everything that Magneto can throw at Onslaught, Onslaught can throw it right back or block it with ease. Would the Brotherhood of Mutants be hanging around? Onslaught Could control them and use them against Magneto. Onslaught himself could distract Mags while someone like Sabertooth rips his head off. P.s. - Surely if Magneto can put up a magnetic shield, Onslaught can use his magnetic abilities to take the shied down? Main thing we are not taking into account with the venue is what would be in there. This is Magneto's fortress from Ultimatum. He would have access to a very usable Mjölnir. Even with the hammer Im still not convinced Magneto could do it. This is how I see it. Everything that Magneto can throw at Onslaught, Onslaught can throw it right back or block it with ease. Would the Brotherhood of Mutants be hanging around? Onslaught Could control them and use them against Magneto. Onslaught himself could distract Mags while someone like Sabertooth rips his head off. P.s. - Surely if Magneto can put up a magnetic shield, Onslaught can use his magnetic abilities to take the shied down? With Mjolnir Magneto stands a decent chance of beating Onslaught but I think it is more likely that Onslaught is the victor here. To what Supercallo said, I like to think Onslaught could undo anything Magneto does. Onslaught has all the powers of Professor X and Magneto but also that of Franklin Richards and X-Man, Nate Grey. Including, according to Marvel Database: telepathy, telekinesis, astral projection, illusion creation, mental bolt projection, sensing mutant presences, manipulating magnetic fields, physical size and strength alteration and affecting reality itself. Manipulating the fields would take away much of Magneto's powers but not all. With Thor's hammer it may give Magneto enough power to rip away Onslaughts armor which is what Hulk did when it was defeated. Its hard to say really. Regarding what pukedrunk just said; As strong as Magneto is, he just doesn't have the same berserker rage that Hulk used. Remember that Bruce Banner had to be separated from The Hulk in order for Hulk to reach the right attacking power to affect Onslaught. We have determined that Onslaught is basically a crazed, physically stronger Magneto with a ton of psionic powers. So, if Magneto doesnt have his shields to protect him and would have to rely on basic telekinesis (which Onslaught would also have) then I think I give this to Onslaught due to his pure brute strength on top of having everything Magneto has. Granted Mjölnir could turn the tides but given Onslaught can also use it in this venue Im not sure that helps Magneto out. 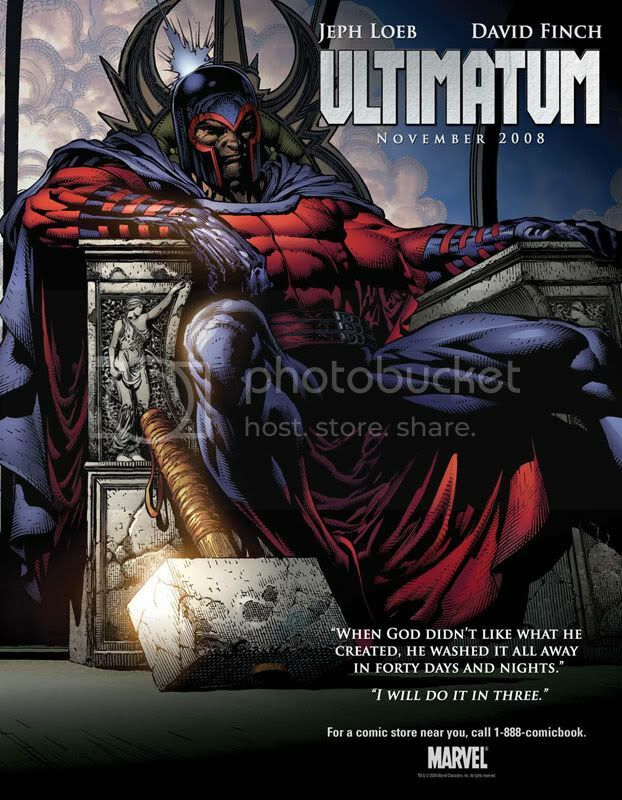 In Ultimatum, Magneto uses Thor's hammer with his magnetic powers to cause worldwide devastation, flooding New York, freezing Doctor Doom's country and a portion of Europe, causing eruptions of volcanoes and earthquakes in other locations. The Hammer fine tuned his powers so he could do whatever he wanted. If he had it against Onslaught, he could defeat Onslaught.